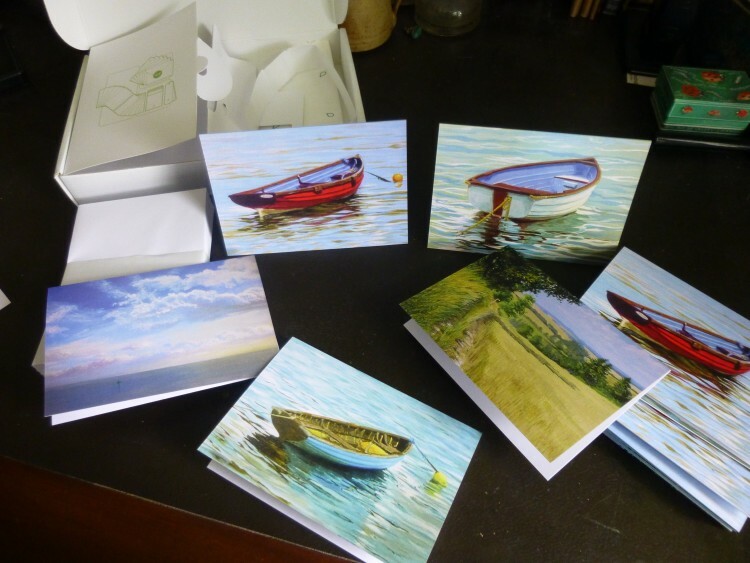 Canvas Print 9 – and a little Mersea bonus! The last day of September – so time for number 9 of the limited edition canvas prints! 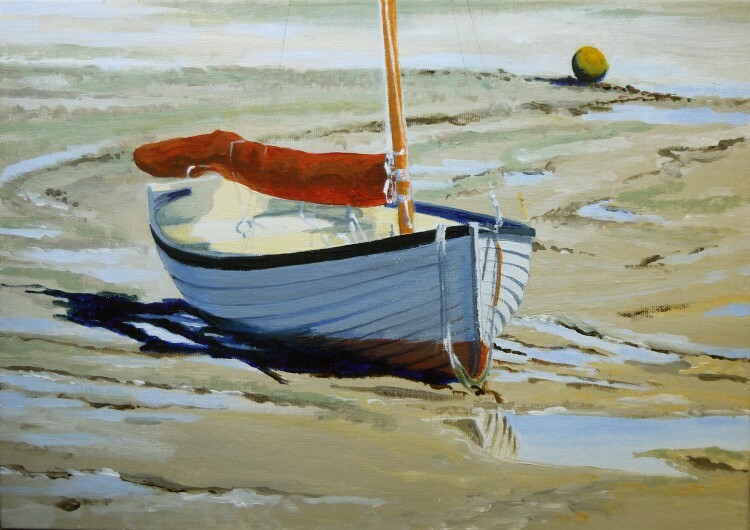 This one is called ‘Dinghy in the Shallows’ and is a West Mersea dinghy. As usual, this is a limited edition of just 6 prints, and all the details are on the Canvas Prints page on the website, with a PayPal ‘Buy now’ button. 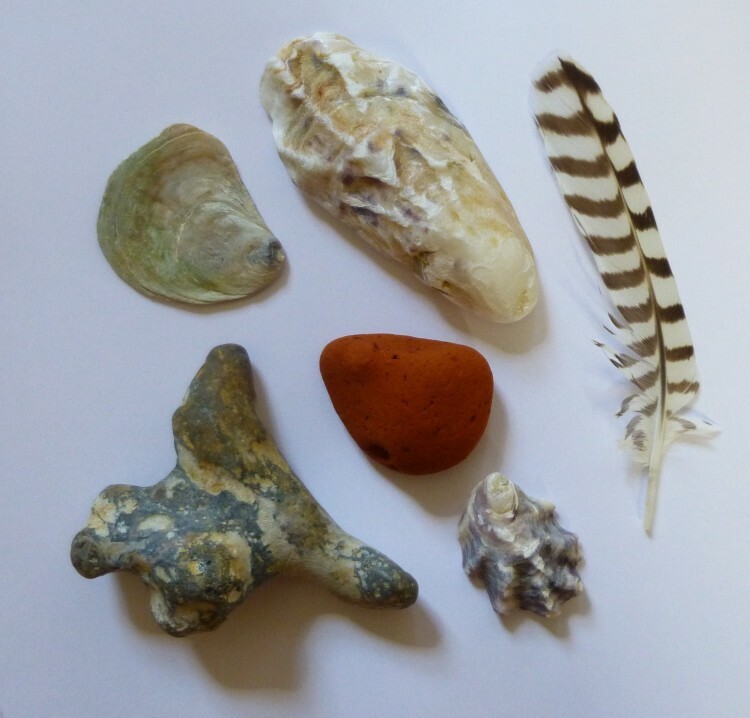 And, as a little postscript to yesterday’s post, here are a few bits and pieces that I picked up on the beach at West Mersea yesterday afternoon. I love the colours! I always come back from the beach with my pockets full of treasures! 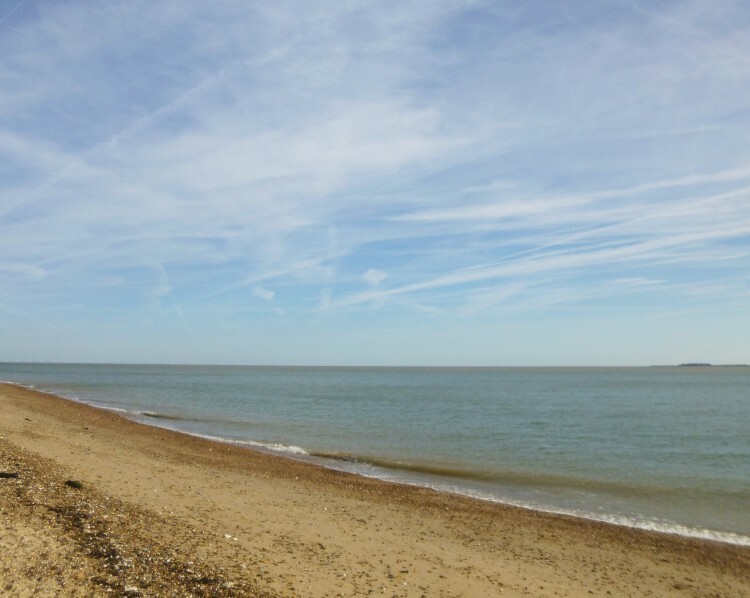 It was such a beautiful afternoon today that I thought I’d go down to the beach at West Mersea. I collected up a sketchbook, my little silver box of drawing things, and a camera, and consulted the tide table. I reckoned that I’d reach the Strood (the causeway which links Mersea Island to the mainland) about an hour and fifteen minutes after high water, so I’d be OK to drive over. Mersea friends who visited Open Studios on Saturday told me that over the Autumn Equinox period they have been having enormous tides – 5.9 metres (have I remembered that right??) – and when I reached the Strood the sea had only just cleared the road, and there were still large pools everywhere! 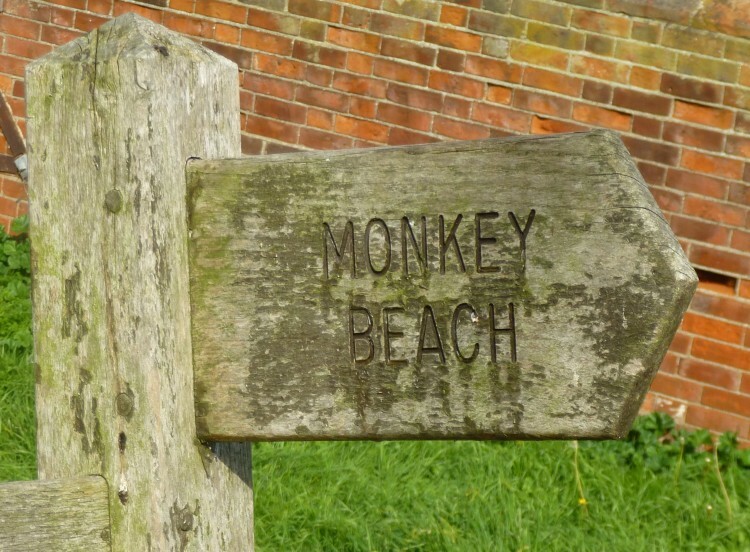 I headed for the Monkey beach, and was soon drawing in the sunshine. The sky was beautiful with long cirrus clouds mixed up with lots of vapour trails from planes. 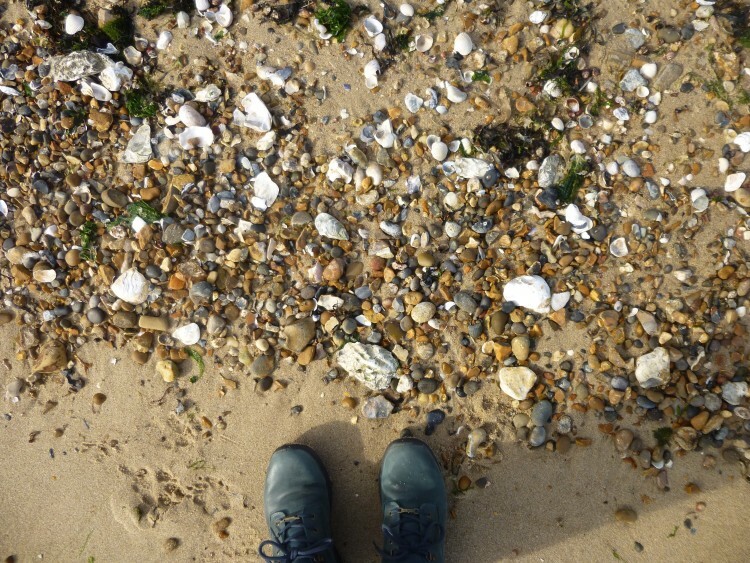 The huge tides had washed up a great many large old oyster shells, some of them dark grey, and others multi-layered as if five or six shells had all grown attached to each other. 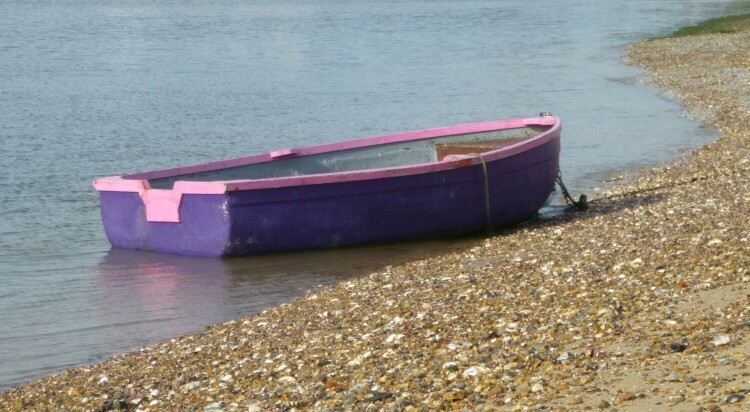 I found one possible dinghy for a painting – and also one that I definitely will not be painting . . . . have you ever seen a dinghy that is such an unlikely colour?? Open Studios : over for another year . . .
I’ve had such a fun time – there have been lots of interesting visitors, lots of good chats, LOTS of sales (far more than I could possibly have hoped for), lots of tea and coffee drunk, and biscuits consumed – a really busy happy couple of days. Of course, I couldn’t do it without some help, and on Saturday my friends Lisa Cockrell (check out www.lisacockrellphotography.com) and Hilary Cowie helped, and on Sunday Graham helped all day, and then took me out for a lovely meal at The Crown at Stoke by Nayland afterwards – which was such a great way to finish off a special weekend – and then to come home and watch Downton Abbey! I am really grateful to all three of them for giving up so much time! Today I’ve been doing all the clearing up!!! I’ve also been doing an audit of what is left, and what, in the way of cards especially, needs reordering, as I have been invited by Rosemary Elden to have an ARTSTUFF stall at her coffee morning in aid of the charity Lepra, and will have cards, canvas prints, jute bags, calendars and Christmas cards there. It will be held at St Leonard’s Church at Lexden, on Saturday, 7th November, starting (I think) at 10.30am – I’ll give you more details nearer the time. Although my Open Studio event is over for the year, some artists in the Colchester area are opening next weekend as well, so do check out www.colchesteropenstudios.org.uk to find out. I’m toying with the idea of opening for two weekends next year . . . .
Well, the furniture is rearranged, the pictures are hung, the cards are set out in the card rack, the calendars, Christmas cards and canvas prints all arranged on the dining room table and in the print browser, the jute bags are hung up on a borrowed coat rack, and the bunting is blowing in the breeze over the front door. Which must mean . . . . . that it’s OPEN STUDIOS TOMORROW!!!!! Can you spot my very newest cards? I’m really excited about meeting old friends and making new friends, and talking about my work. If you are local to Colchester, you are warmly invited to come, and do bring your friends. 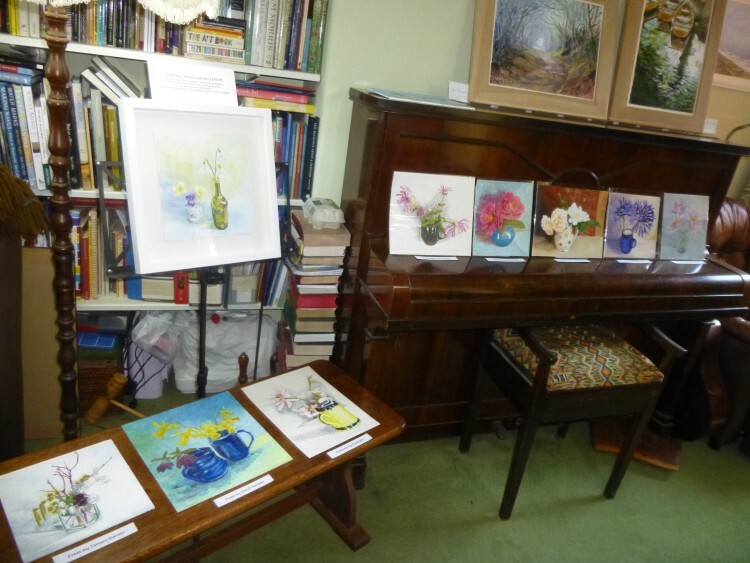 All the ‘From my Garden’ paintings – nine so far! 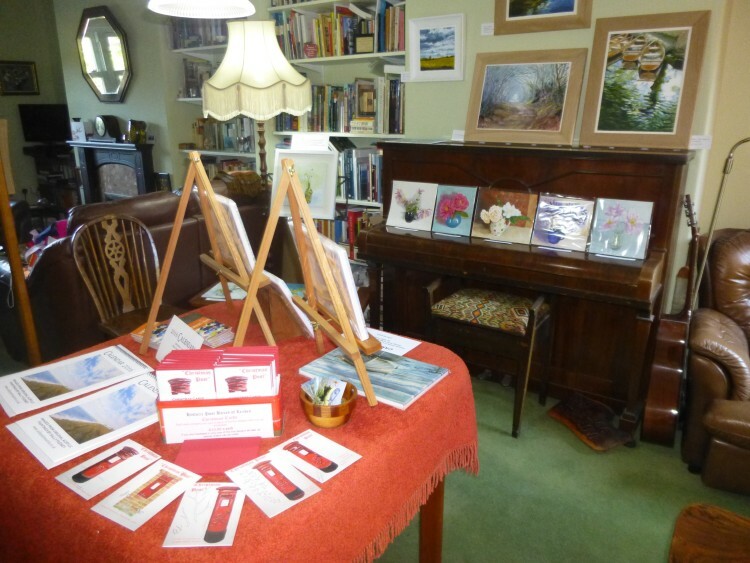 All the details are on the Colchester and Tendring Open Studios website www.colchesteropenstudios.org.uk If we have never met in person do introduce yourself – I love meeting my lovely blog readers! Just in time for Open Studios, five new card designs have come back from the printers (www.moo.com) and I’m really pleased with them – I think they’re the best batch I’ve done! There are three dinghies, Dinghy on the yellow rope, Poppy on the Blackwater and Dinghy on the yellow buoy; a seascape, Afternoon Light, West Mersea; and a landscape, Essex Field Path II. They are now all bagged up and priced ready for Saturday. I’ve also just received three lovely new canvas prints of the three dinghies mentioned above, which have also come out really well. Yesterday I finished framing my last two new paintings, and today I’ve been clearing the decks in the dining room ready to put everything out – and I’ve even started to hang some of the paintings! I’ve used a completely new frame for Essex Field Path II – usually I use natural oak for landscapes, and a deep white frame for dinghies and seascapes, both with a plain white mount. But when I put the oak frame against Essex Field Path II at the framers it looked awful as the colour was much too warm and brown. So after trying a few different frames I have gone for a slightly greenish-cream frame, with a dark charcoal mount – and it sets the painting off beautifully. On Monday I delivered a jute bag printed with Before the Harvest to the winner of the free give away that I ran on the blog earlier in August. Shirley, who only lives on the other side of Colchester to me, was delighted with her bag, and said it was even nicer than she had imagined! 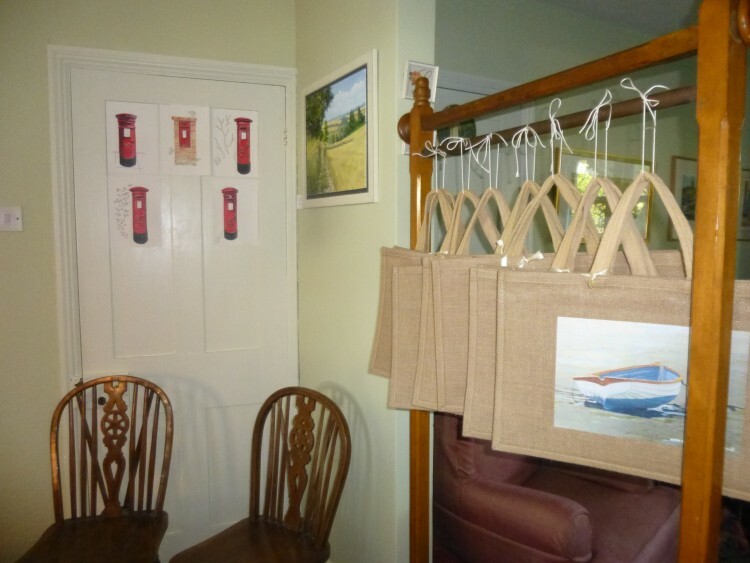 I have lots more designs of jute bag, too, all hanging up ready for the weekend! Just finished this afternoon, this is ‘Waiting for the Tide II’, another dinghy I found earlier in the summer at Heybridge Basin. It was a beautiful, sunny day, but the tide was far out. 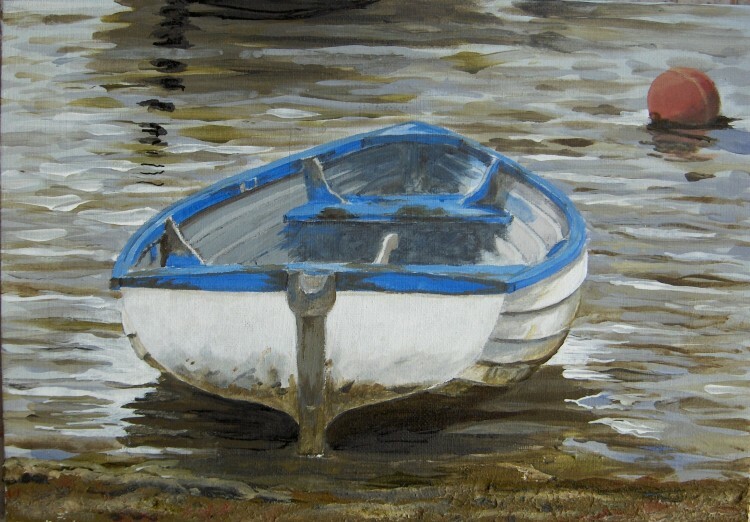 This one is a companion piece to the first ‘Waiting for the Tide’, which was also a Heybridge Basin dinghy, and which can be seen on the 2015 gallery page. 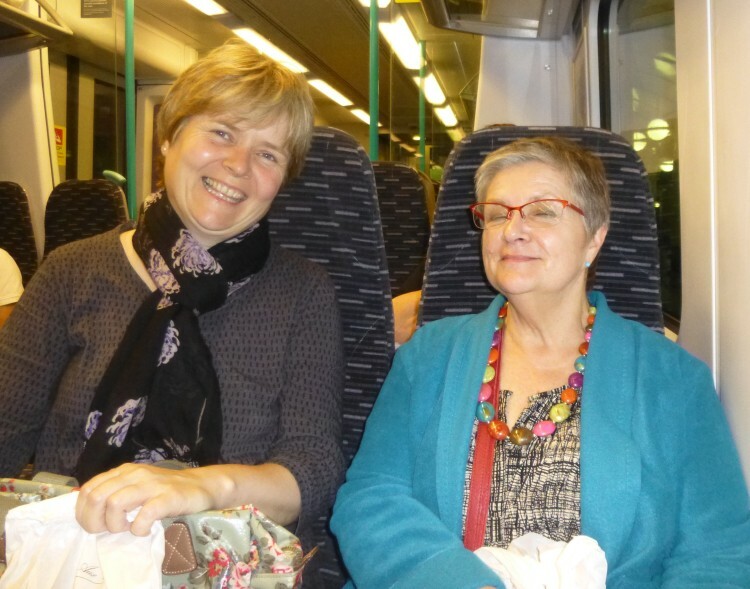 I had a lovely day yesterday in London with my friends Helena and Christina from Wivenhoe. One of our aims was to descend on the Gudrun Sjoden shop in Monmouth Street, and, if we didn’t quite try on everything in the shop, we made a good attempt! All three of us came out clutching their lovely fabric carrier bags full of goodies. We also found a lovely French bakery and café – and came out of there clutching bags of goodies, too! And now! There is only a very few days left before Open Studios! Have I mentioned this before? . . . .
I’m opening my studio and house as part of Colchester and Tendring Open Studios on 26th and 27th September from 11.00am to 6.00pm each day. 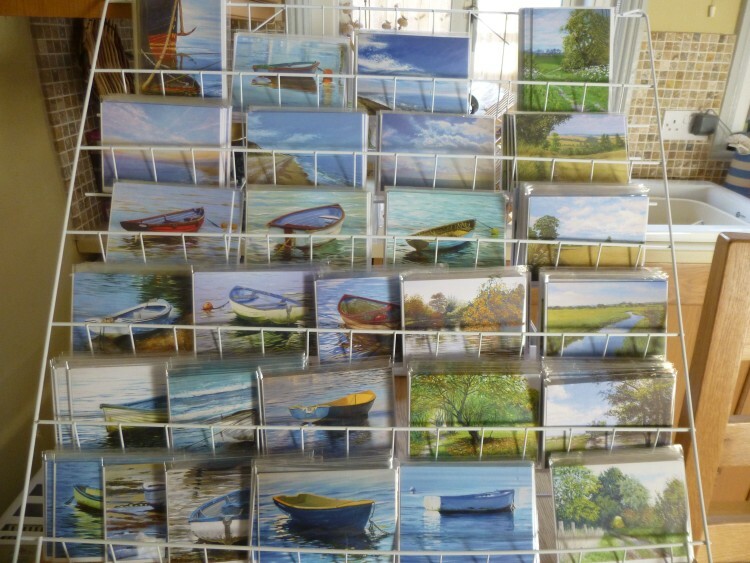 There will be recent paintings, printed jute bags, canvas prints, 2016 calendars with one of my paintings for each month, greetings cards (including some brand new ones), and my ‘Christmas Post’ Christmas Cards for sale – but there is absolutely no obligation to buy. 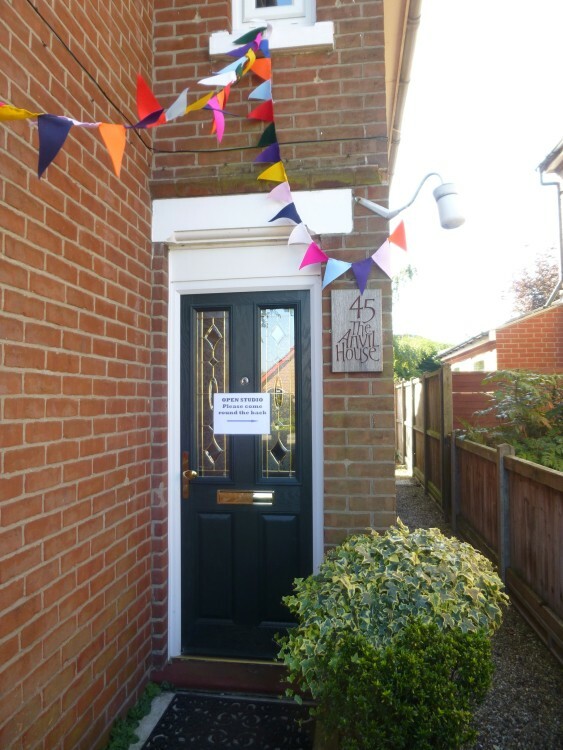 If you are near Colchester, do drop in for a browse, a cuppa and a chat. All the details can be found on the Open Studios website, which is www.colchesteropenstudios.org, where you will also find other studios near me that are open at the same time – so you might want to look some of those up, too, and make a day of it! I shall be delighted if you can come, and look forward to seeing lots of my lovely readers next weekend. Fruit was not the only thing we brought back from the Peddars Way! 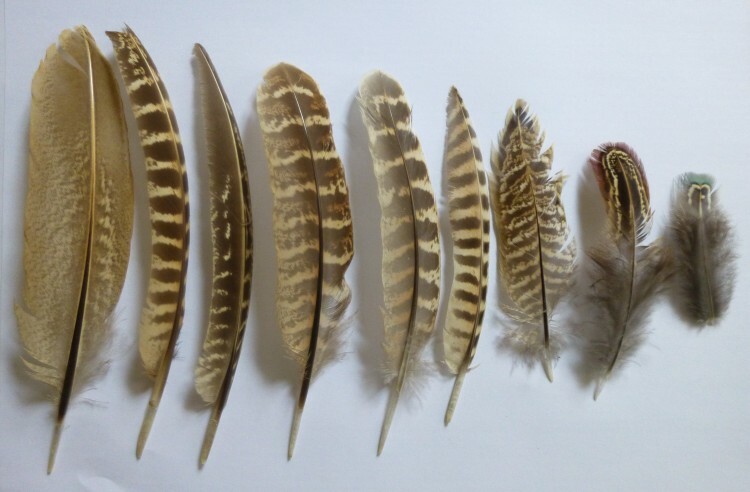 I think they all belong to pheasants, except the one on the extreme left, which may be an owl’s feather. Any ideas? 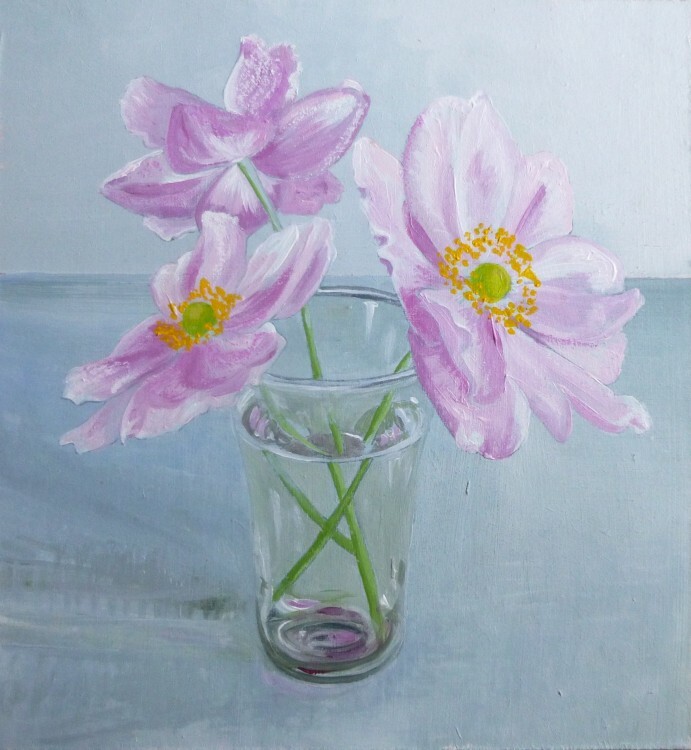 So this is number nine in the ‘From my Garden’ series, and features three pink Japanese anemones. I put them in a small glass which is one of a set of six which my mother passed on to me – they had been one of her wedding presents, but as far as she could remember she had never used them. They are extremely thin glass, and appear to have been hand blown, so I imagine they are quite old. She thought they were intended as sherry glasses. I do occasionally use them for port! They make very dainty little vases, anyway, and I thought they suited the delicacy of the flowers, and the slightly greenish glass set off the pink rather well. Click on the blue post title in the box on the right of your screen and the comments box will open up at the foot of the post. 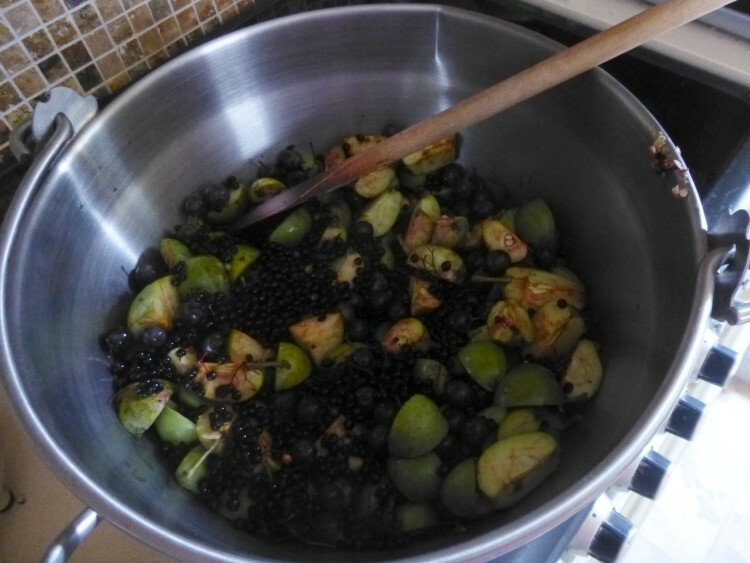 I don’t think I have ever seen so much wild fruit as we saw along the Peddars Way. 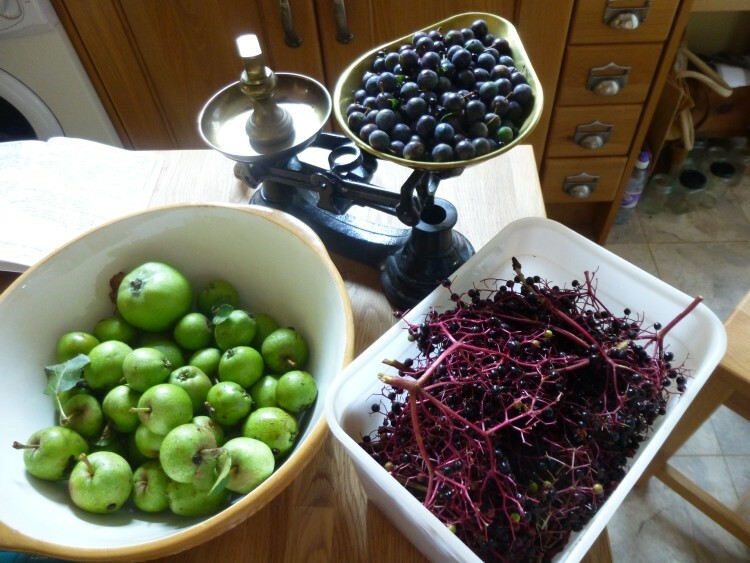 The hedges were weighed down with crab apples, sloes, blackberries, elderberries, hips and haws. We brought home as much as we could, but we were a bit limited as we hadn’t got anything very sensible to carry it in. I have to say Jill picked far more than me, as she picked while I was drawing! On Thursday I brought all the fruit back to the Anvil House. 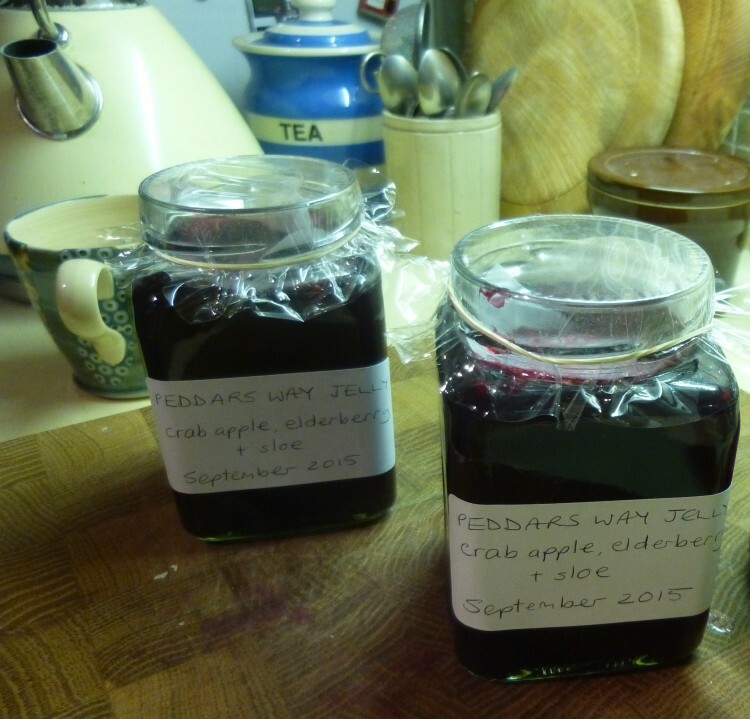 It was all boiled up in the preserving pan with some water, and then the pulp dripped through the jelly bag overnight. I think the apples were rather under-ripe as the pulp only produced a pint and 3fl. oz. of juice, but it was just enough to make two pots of jelly, one for each of us, and a very little over. It is a very dark colour, almost black. And it tastes amazing . . . . .
Just making a start on painting ‘From my September Garden’ this afternoon! I spent a few days in Norfolk this week. 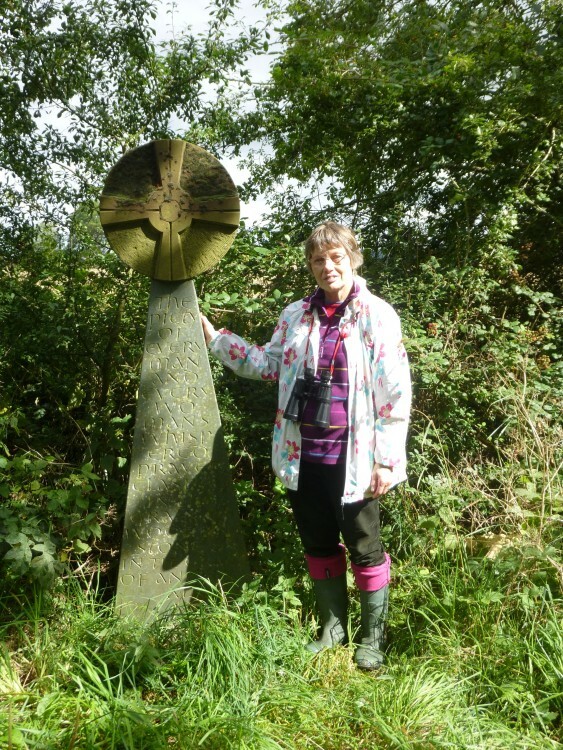 My sister, Jill, (who lives in Kings Lynn in West Norfolk) and I walked a couple of sections of the Peddars Way. 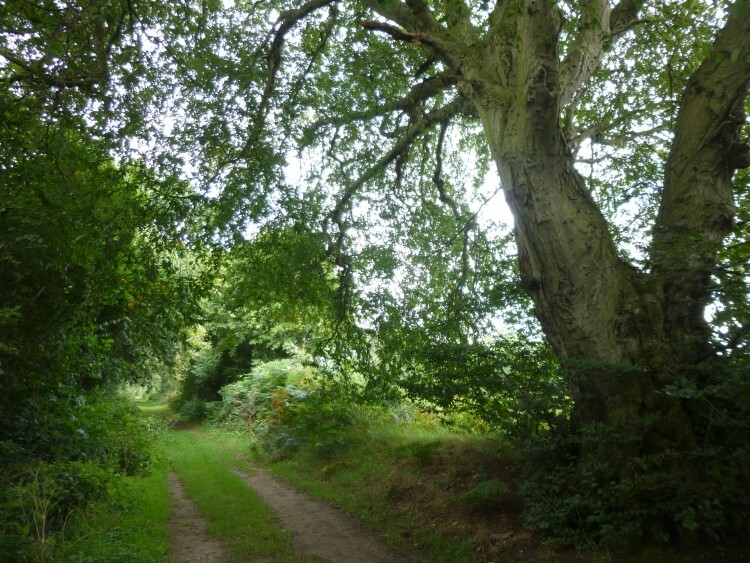 This is a very ancient track-way running from near Thetford to Holme-next-the-Sea on the North Norfolk Coast. It is now a national trail. I got interested in it when storyteller, Hugh Lupton, sent me a copy of his book ‘A Norfolk Songline’ in which he tells stories which could have happened along the Peddars Way at different times in history, combined with his poems around the idea of walking and time. Extracts from the poems were carved by Tom Perkins onto standing stones which were erected at points along Way. 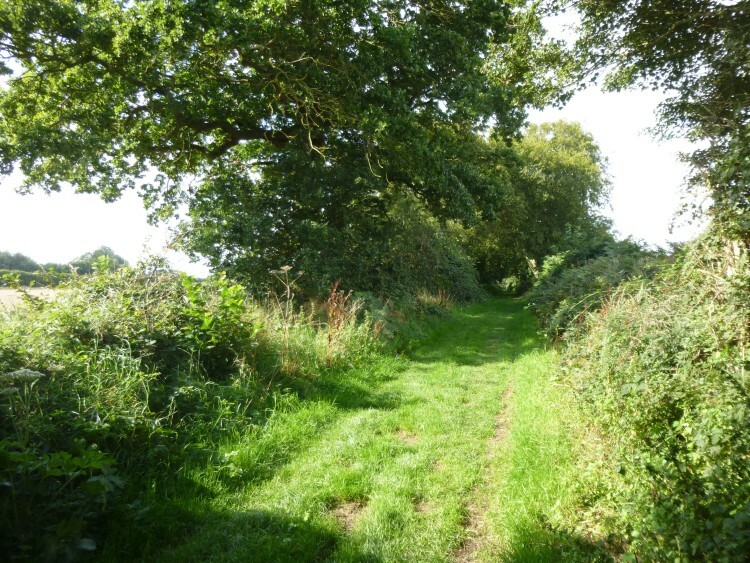 Looking at the photos in the book, and in the official trail guide I could see that a series of paintings of the Peddars Way could be very interesting. We only managed two stretches this week, as it was so wet on Tuesday that we abandoned walking. 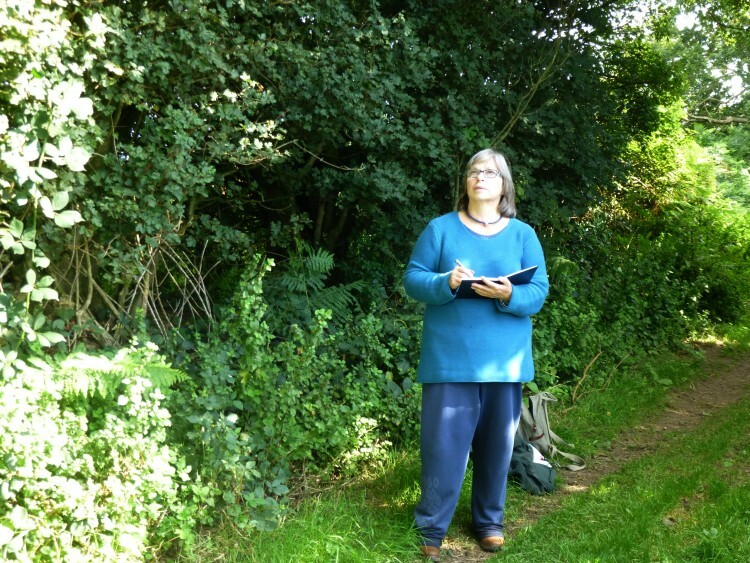 But on Wednesday we set off from the village of North Pickenham and walked the stretch called Procession Lane – the name thought to be something to do with the ceremony of ‘beating the bounds’. 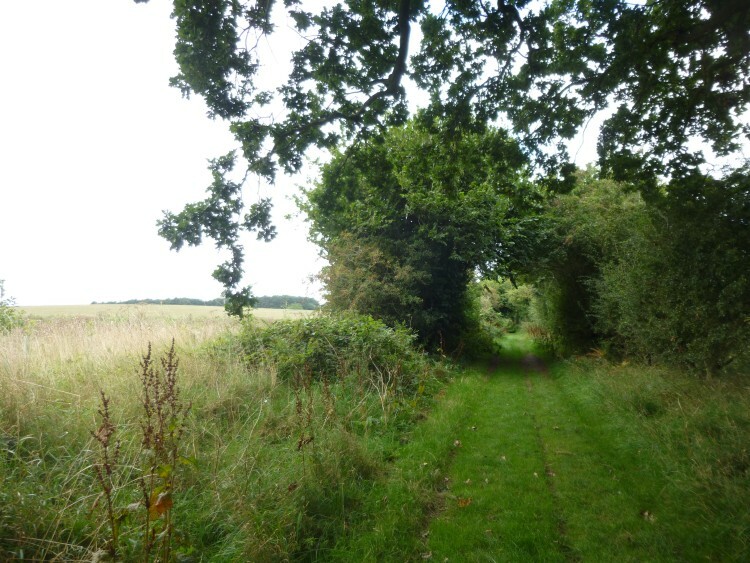 The Peddars Way at this point is a wide grassy green lane, with ancient trees, especially huge oaks. 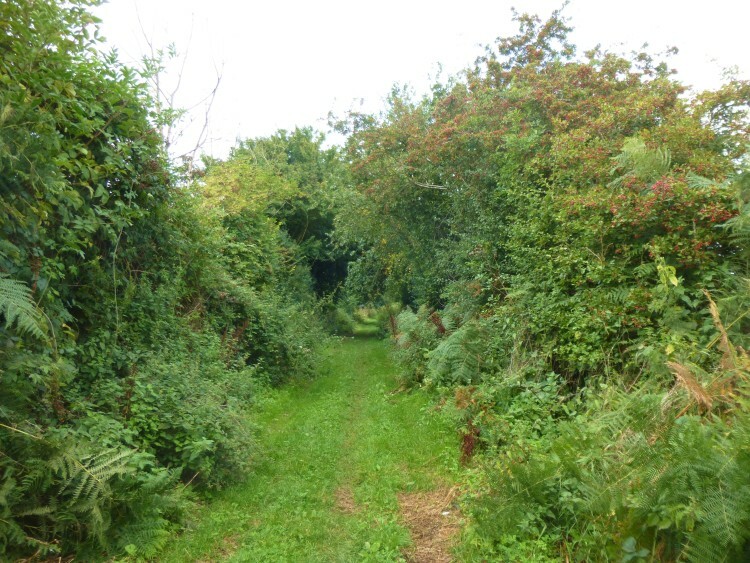 The hedges were weighted down with wild fruit – crab apples, sloes, blackberries, elderberries. 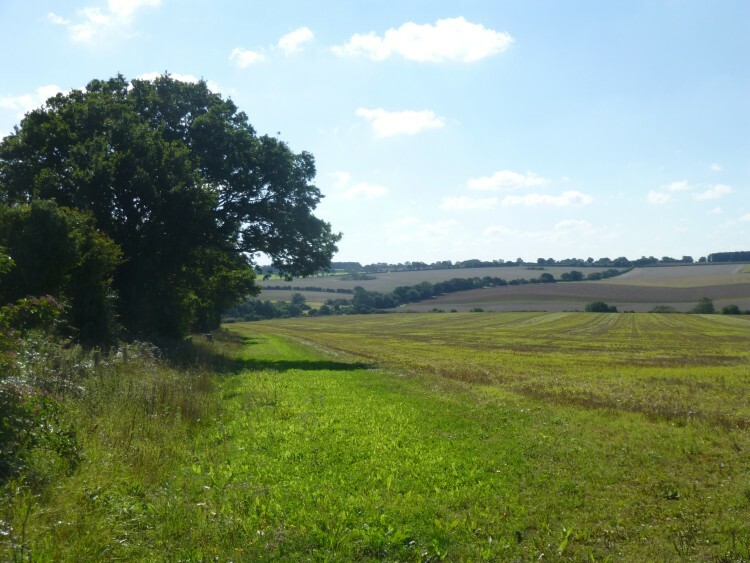 We saw buzzards, and lots of speckled wood butterflies, a hare, large numbers of partridges and pheasants, and the sun came out, and we really enjoyed the walk. We walked as far as the crossing with the A47, where there is a very convenient, though very unexpected McDonalds, so we stopped and had hot chocolate and a snack, before retracing our steps back to North Pickenham where I’d left the car. On the way back I stopped to draw likely looking places and Jill picked lots of the wild fruit for me to make into jelly once I got home. 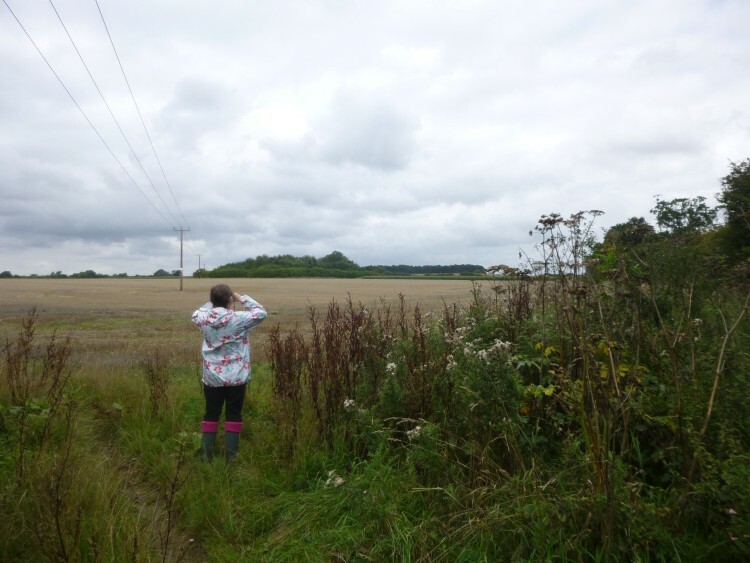 On Thursday we started from the point where the Peddars Way crosses the A148, where there is a convenient car park, and again walked north. The character of the Way was quite different – the ground is high, and there are far reaching views all around. The whole feel of this section is much more open. Again we saw buzzards, and this time quite a few yellow Brimstone butterflies, and lots of spindle trees in the hedges. I got some useful drawings and loads of photos, that will give me enough information to paint, and we definitely want to walk some more sections when we can arrange the time! 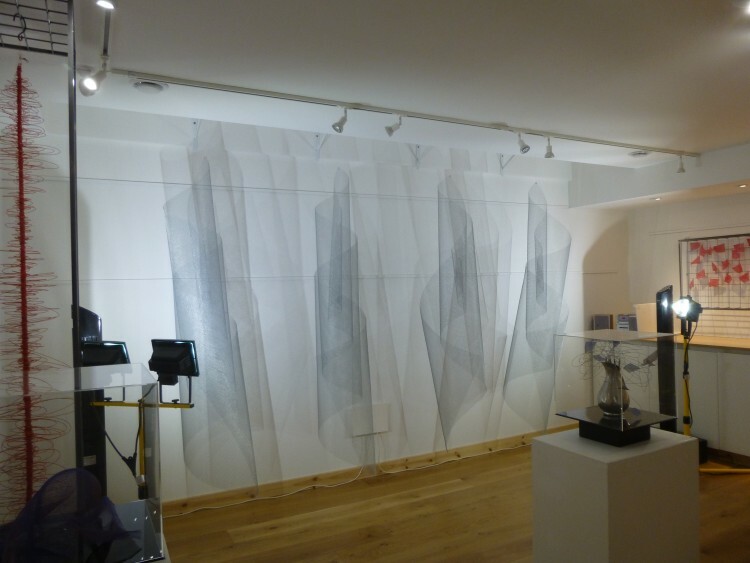 I’m so pleased that Graham and I caught Charlotte Bernays’ show at the Sentinel Gallery in Wivenhoe. 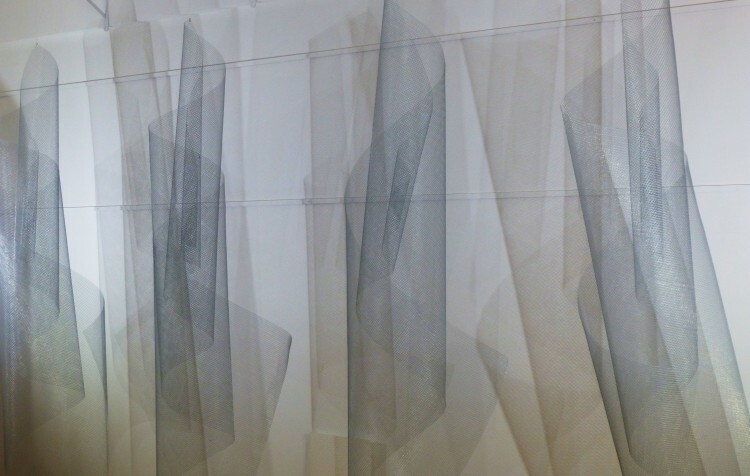 We saw some of her work at Open Studios last September – enough to be intrigued – and we weren’t disappointed when we saw more yesterday! Charlotte is showing some fascinating pieces, many constructed from metal in various ways, and with beautiful use of Chinese ink, and ground lapis lazuli. We were both mesmerised by her large installation, ‘River’, in which loose coils of wire mesh rotate to music by Arvo Part, representing the inflowing and out-washing of the tide in the river Colne near Charlotte’s home. The constantly moving shadows cast on the wall were beautiful. I also particularly liked the small paintings of flocks of birds with Chinese ink on a gold metallic ground – they were really atmospheric, and very reasonably priced. I wasn’t a bit surprised that they had all sold and that Charlotte is taking commissions! The show continues until September 13th, and is open Wednesday – Sunday. Do go if you get the chance! I finished preparing three Lambeth Degrees for the Faculty Office on Monday, and got them in the post on Tuesday, and then on Thursday received another four Faculties to do! That’s keeping me busy! Then I had two afternoons spent with former teaching colleagues – it is always lovely to see them and catch up with what’s been happening . . . . and visitors call for CAKE! 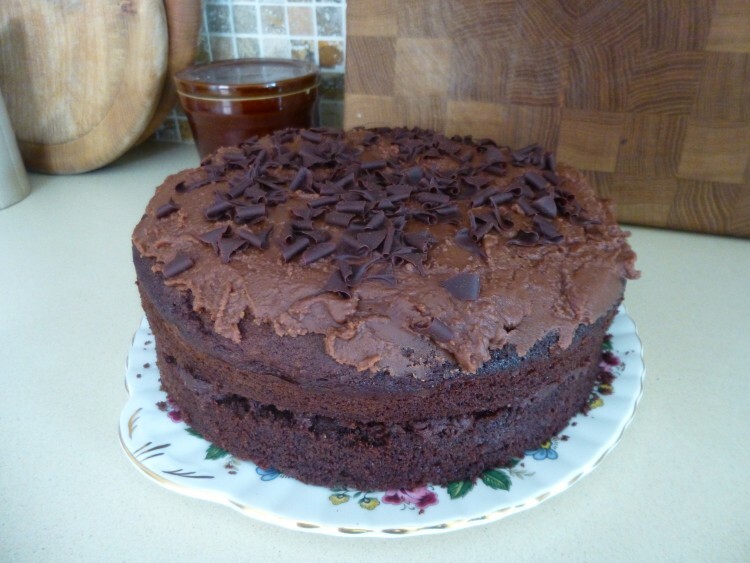 This is my current favourite chocolate cake recipe from River Cottage Handbook No. 8 ‘Cakes’ which is by Pam Corbin. It is seriously delicious . . .
Lisa brought her magic binding machine with her, and we put the spiral binding on all my calendars – or I should say Lisa did, as all I did was punch the hanging holes in the top and make tea! 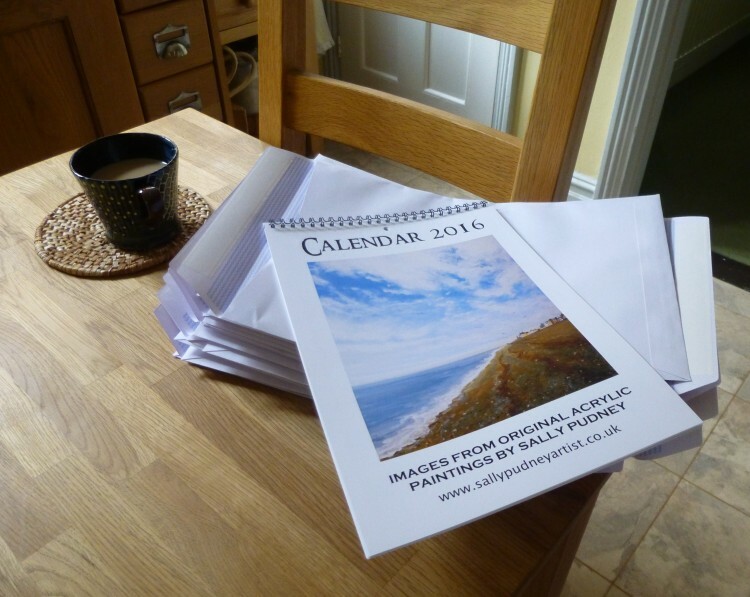 The calendars are now all packed in their envelopes ready for Open Studios. It’s getting quite close now, but I haven’t got too many jobs left on my list! 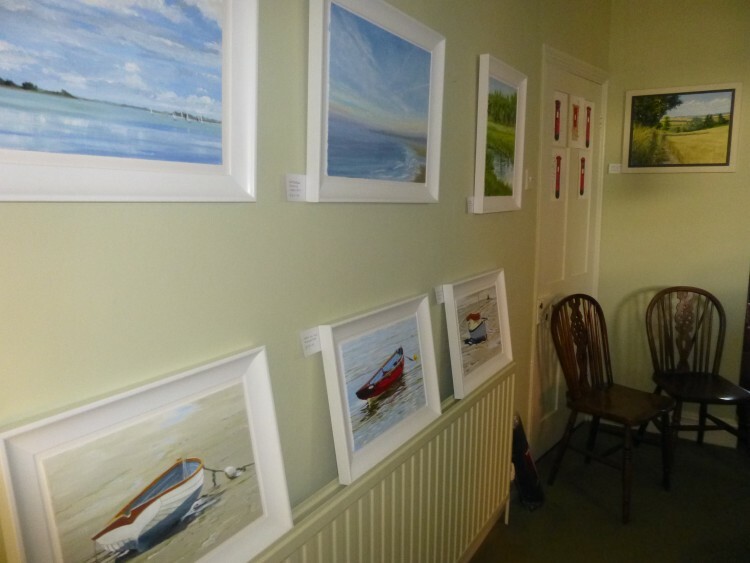 And on Thursday I heard that all four of the paintings that I had exhibited in the Haylett’s Gallery’s Summer Exhibition had been sold – lovely news, and a big surprise! Next I need to get started on my September ‘From my Garden’ painting, and I also have two more dinghies from Heybridge Basin in the pipeline.